The Windows Mobile operating system is used on many cellular phones and PDAs. The Windows Profile plays both Windows Media Video (WMV) and AVI Video. In addition, WMA audio files are also played. To select media conversion properties for your Windows Mobile device, click Formats >> Select Device Profiles >> Windows. This is an example of a Mobile WMV Profiles video device profile. 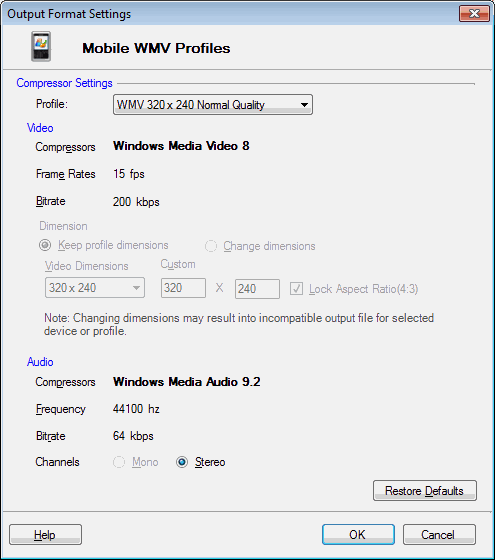 The Windows Media Video 8 compressor offers a near-DVD-quality video at low bitrates. The frame rate is set to 15 Fps and the bitrate is set to 200Kbps. The Windows Media Audio 9.2 compressor produces files that are compatible with almost all playback devices. The frequency is set to 44100 Hz and bitrate is set to 64 Kbps. The Stereo audio channel creates an impression of sound heard from various directions. Formats >> Select Device Profiles >> Windows >> AVI Video (High Quality). 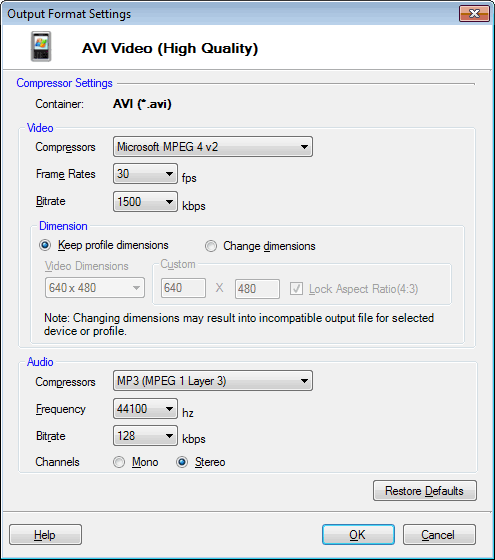 By default, the video file format is AVI (*.avi) and compressor is Microsoft MPEG 4 v2. The frame rate and bitrate is set at 30 Fps and 1500 Kbps respectively. The video dimensions can be retained or customized. For this device profile, you can choose among 3 compressors; XviD Encoder, Intel(R) H.264 (AVC) and Microsoft MPEG 4 v2 (default). The codec are listed in order, from the most compatible to least compatible and from good compression to the best. The default frame rate and bitrate is similar in XviD Encoder and Microsoft MPEG 4 v2. However, the bitrate is reduced to 1200 Kbps for the Intel(R) H.264 (AVC) compressor. The frame rate is the same for all the compressors. You can choose to retain the default video dimensions or customize it. When compressed with MP3, the media files play on almost all portable audio players. The frequency is set to 44100 Hz and the bitrate is set to 128 Kbps. The Stereo audio channel creates an impression of sound heard from various directions.